Infected deer begin to show symptoms within a week of being bitten by a midge carrying the virus. They develop a high fever, one reason many dead deer are found in or near water. It’s supposed to be just another late-summer scouting trip, but the unmistakable stench of death leads you down to the ribbon of water that flows through your land. There, just a few feet from the stream, lies a bloated, fly-covered carcass of a velvet-antlered buck. Poachers? You don’t see any visible sign of trauma, so you back out and continue on your way. A hundred yards later, you smell it again. By the end of the day, you count four dead deer on your land. Odds are those deer fell victim to epizootic hemorrhagic disease, more commonly called EHD or HD. The odds are also pretty good that you found those deer during a particularly dry year. Hemorrhagic disease is a viral infection transmitted by biting midges, a tiny insect often called no-see-ums, punkies or sand gnats. Although they are smaller than a common gnat, biting midges can inflict an unpleasant, itching bite to humans, especially when numerous midges descend upon a victim. They don’t transmit HD to humans. It is often called “blue-tongue,” which, according to University of Georgia wildlife disease researcher Dr. David Stallknecht, is a different type of virus than EHD. Infected deer start to show symptoms within a week of being bitten by a midge carrying the virus. They develop a high fever, which is one reason so many dead deer are found in or near water. Researchers believe infected animals try to lower their body temperature by lying in the water. They also drool, become lethargic and have no appetite. In many instances, the outer sheath of their hooves will fall off. Death can take weeks. Disease outbreaks in whitetails are most common throughout the Southeast, particularly in dry years. That’s when mud along pond, river and creek banks are exposed, creating additional habitat for the midges, which lay eggs in that mud. Drought also brings more deer to the water remains, concentrating deer around those areas with lots of those insects. In fact, there is a direct correlation to drought and the intensity of an outbreak. The disease is endemic, meaning it is a naturally-occurring part of the ecosystem. Researchers aren’t exactly sure how the various HD and blue-tongue viruses survive through the winter, but disease outbreaks typically subside once cold weather sets in. The midges either die or are far less active. 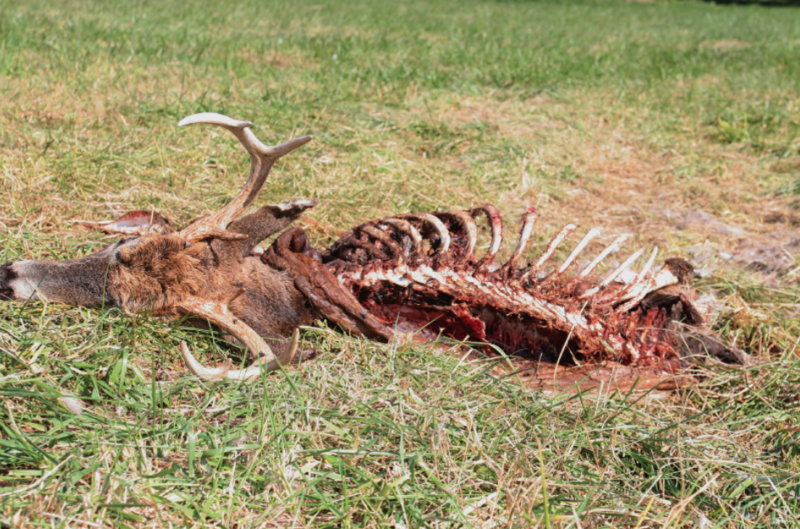 It’s important to understand the difference between hemorrhagic disease and chronic wasting disease (CWD). Some hunters don’t know the difference and often refer to one disease when they mean the other. While HD can be fatal, CWD is always fatal. It is a neurological disease caused by an abnormal form of a cellular protein found in the central nervous system. An infected animal’s immune system does not respond to the disease. Worse, it is contagious. If that’s not frightening enough, it can remain viable in the environment for years. Fire doesn’t destroy it. Neither does a bleach wash.
CWD is a relatively new disease. It was first diagnosed in captive mule deer in Colorado in the late 1960s. Researchers still aren’t sure where it came from, but some believe it is a variation of scrapie, a similar disease found in domestic sheep. It has since been found in wild or captive deer or elk in 25 states and three Canadian provinces. While the number of deer killed so far by CWD is a fraction of those killed by HD, wildlife managers are much more fearful of the long-term impact of CWD. Adams acknowledges that deaths from HD can be devastating, especially when a large percentage of the deer herd succumbs to the disease. The good news is that populations tend to bounce back quickly. Fewer deer on the landscape now translates to better and more available food and cover for those deer that remain. Does tend to have more fawns when conditions are good. “That rebound can be interrupted by severe winter weather in the north. If populations are already depressed from HD and they get hit with a really severe winter, then we can expect populations to take longer to rebuild,” says Adams. That didn’t happen in northern Montana after an estimated 80 percent of the state’s famed Milk River herd died from HD in 2011. Mild winters in the following years prevented additional deaths. That, combined with a reduction or complete elimination of antlerless tags in the region, helped speed the herd’s recovery. Hemorrhagic disease is not always fatal. Although it can kill a large percentage of a local population, most outbreaks typically kill just a small fraction of a local deer herd. Stallknecht says die-off rates can vary and are highly localized. When outbreaks occur in north Georgia, for instance, mortality rates can be as high as 40 percent. Outbreaks in southern Georgia experience almost no mortality. That’s because whitetails that survive an infection tend to develop an immunity to it. Where outbreaks are more frequent, more deer build an immunity. On the other hand, where it is less common, death rates tend to be higher. Researchers also now know that the severity of an outbreak is not related to deer densities. “For a while, the science community thought outbreaks were more severe in places with a high abundance of deer, which would seem to make sense,” says Adams. The disease is not contagious, though. It is not spread through animal-to-animal contact like CWD. Instead, deer only become infected after being bitten by a midge carrying the virus. Since the insects are highly mobile, they can bite deer over a large area, no matter how high densities are. These days, reports of HD outbreaks are coming from every corner of whitetail country. That’s likely due to two reasons, figures Adams. First, various hunting-related media outlets are more likely to report on the disease. With countless web sites dedicated to hunting, it’s easier to stumble upon some sort of article related to HD. It’s just publicized more frequently. There is another, more sinister reason HD is making the news more frequently. Outbreaks are occurring in places they have never occurred before, they are more frequent and in many instances, more intense. Connecticut saw its first outbreak ever this year, there have been repeated and severe outbreaks in Michigan and New York in the last 10 years. Outbreaks in New Jersey are occurring about every three years now. “It used to be every 10 or 20 years,” adds Stallknecht. If that’s not frightening enough, he says an increasing number of midge species are carrying new variations of HD and blue-tongue. These new viruses may be coming from the tropics, possibly a result of warmer weather. Nothing can be done to prevent future disease outbreaks and because it is a virus, there are no possible vaccinations to prevent infections. Besides, it’s simply not realistic to treat enough deer to have an impact. Neither is providing additional water resources. They do occur during dry summers, but some years, outbreaks either don’t happen at all or they are minimal. “The only thing you can do when your deer herd has been subjected to an HD outbreak is to protect the does. They are responsible for the fawn crop, so the fewer does you shoot this year, the more deer you will have in the population next season,” says Adams. If you find dead deer in the late summer and early fall, report it, agree Stallknecht and Adams. The more data a state wildlife agency has, the better the science community can understand hemorrhagic disease and its broad impacts to deer and deer hunting. Whether or not it will have a noticeable long-term impact on deer populations remains to be seen. As outbreaks increase in frequency and intensity, some areas may indeed see a decline in populations.